“Scholastic: Michael is a senior who has been homeschool since Kindergarten with the Davis County Homeschool Assistance program. He has done well with his Academics and will be graduating with a 3.86 GPA and is a member of the National Society of High School Scholars. He was on the honor roll for 2 years with extra classes he took at the Ottumwa Christian School. Music: He has played the piano for over 10 years and was able to go to the Southeast Iowa State Competition in 2009 and 2010 receiving a Division I rating both years. For 2 years he enjoyed singing and was a member of GOVAP – the Greater Ottumwa Vocal Arts Project. This group traveled and sang and put on concerts in South East Iowa. Sports: He has been actively involved with sports playing Basketball for the Ottumwa Christian School and Davis Co. High School; playing on Varsity and Junior Varsity respectively. He also played soccer through all his grade school years and in the 9th grade for the Ottumwa Community Soccer Club. For years he has attended the Gardner Tae Kwon Do class and was able to attain a First Degree Black Belt. In the spring of 2010 he just completed the American Red Cross Course to qualify him as a Life Guard for the local YMCA. Community & Church: For the community he has been an active volunteer at the local hospital; Ottumwa Regional Health Center for the last 3 years. 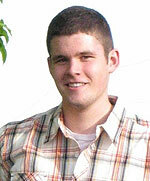 He is also a teen volunteer for the Heartland Pregnancy Center which is a crisis pregnancy center. He helps with fund raising, practical helps and services. He has been very involved in his church since childhood. As a teen he has worked as a leader for the youth group, assisted with the Awana kids Club, helped with youth and mission fund raising, working as an assistant in the Sunday School and nursery, helping with church maintenance, and other needs as they have arrived. He is an active member in the youth group. He has also assisted with the greeting visitor programs. During his grade school years he worked hard on receiving the Timothy Awana Trophy” at Northgate Alliance Church. The work to achieve this award is similar to working for an Eagle Scout Award. For his community he has helped with the “Make Ottumwa Shine” program cleaning up streets and parks of litter. One spring in particular he and his family worked on a major highway and park area that helped prepare for the Ragbrai Biking Event that brings bikers from all over Iowa as well as from around the world through different cities in Iowa 2009 coming through Ottumwa. He also served as a volunteer helper for the NICHE (Network of Christian Home Educators) convention held each summer in Des Moines. This is the state convention for families that are homeschooling in Iowa.